A consortium of Tasmania’s major ship builders and specialist maritime businesses, including the Australian Maritime College, is leaving no stone unturned in a bid to win a $600 million Pacific patrol boat replacement project with the Australian government. 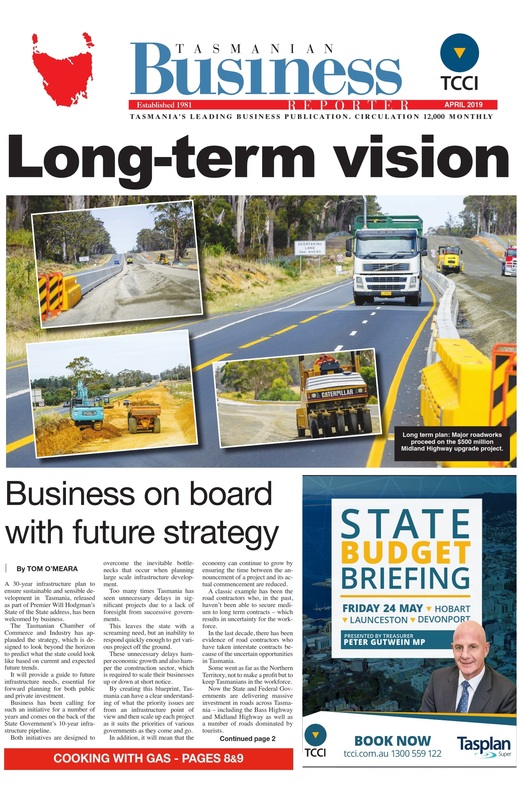 The August 2015 edition of the Tasmanian Business Reporter is now available. Click on the image to read all the latest business news from around Tasmania. Huge stakes are on the table for the Tasmanian consortium, which already employs more than 1500 people. A successful bid will increase consortium employment by more than 10 per cent and underpin Tasmania’s shipbuilding industry over the contract’s eight years, to deliver 22 patrol boats. The increased workforce would require additional production trades and tertiary qualified workers, create an annual draft of apprentices each year, as well as providing many positions for unskilled labour. The consortium includes Incat Tasmania, Haywards Shipyards and fabrication operation, and others within the Tasmanian Maritime Network, along with ThyssenKrupp Marine Systems Australia, and UGL Engineering. Incat Tasmania brings nearly 50 years of innovation and quality to the bid, highlighted by its wave-piercing catamarans and smaller ferries for local and export markets. Haywards has a long tradition of steel boatbuilding in Margate and a steel fabrication base in Launceston and Wynyard. Launceston also features in the bid as the patrol boats’ training base at the Australian Maritime College, at AMC Search. TKMSA is a specialist Australian naval designer based in Melbourne, while UGL engineering is a major engineering and property services company employing 7700 globally. Each has a strong record in naval design, acquisition and support programs over many years and a track record of successful cooperation. Chairman of the Tasmanian Maritime Network Richard Lowrie said Tasmanian business, industry, the community and the economy would significantly benefit from Tasmania winning this project. “Even Australia’s defence capability benefits, as it expands Defence’s supply network to a broader base and importantly into regional areas,” Mr Lowrie said. While naval shipbuilding in Australia has developed a dependency on federal government policy, the Tasmanian Patrol Boat solution is quite different. “This project will simply add to the order books of established and successful businesses, in a sustainable way that is both great for regional employment and in building for longer term success,” says Incat Australia managing director Craig Clifford. The bid was submitted recently and is undergoing the Defence evaluation process. The consortium hopes the emphasis on the maritime heritage that is Tasmania, combined with our first-class technical and support solution, provides a compelling case for our bid. Mr Lowrie said Tasmania had missed out in its share of Defence spending for far too long and here was the opportunity to balance the ledger one and for all.